6789.com was created in order to generate web traffic. 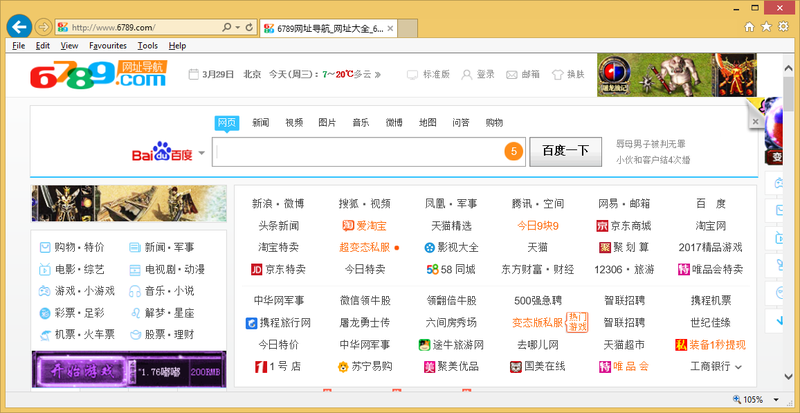 It is a browser hijacker that is targeted towards Chinese-speaking computer users. Although the app itself may not cause any direct harm to your computer, it does not mean that it is something that you should keep installed. Among the many annoying symptoms of the hijacker are browser settings alternations, increased amount of advertising data in your browsers, constant redirects to unknown sites, tracking cookies, and more. There is no reason why you should tolerate any of these symptoms. We advise that you get rid of 6789.com as soon as you can. The most obvious symptom of the potentially unwanted program is that it changes your browser settings. Your home page, new tab, and your default search provider get switched to the 6789.com website. This page may not seem that much different from other search portals that you have encountered, but we assure you, it will not bring you the most relevant results. The engine will present you with sponsored links that may not be relevant to your search terms at all. Moreover, you will notice various advertisements on other pages that you go to and these ads will not all be safe either. It is important for you to know that none of the ads that the hijacker shows you are endorsed by it. This means that the content that you see is not checked by anyone and that if you click on it, you risk landing on a corrupted site. Since the hijacker holds no responsibility for the data that it inserts into your browsers, you will not be able to blame its creators for what happens to you after you get rerouted to a malign page. You could fall for an online scam and infect your PC with malware, waste money, share personal details with cyber crooks, and so on. If you wish to avoid that, you should delete 6789.com from your browsers without further delay. There are two 6789.com removal options you can choose from: manual or automatic removal. If you decide to erase 6789.com manually, you are welcome to follow the instructions presented in the manual removal guide below the article. Make sure that you uninstall the hijacker’s related app as that is the only way to eliminate 6789.com from your browsers for good. If, however, you decide to choose the more effective and beneficial method, i.e. automatic removal, you will need to use an anti-malware tool. The malware prevention and removal tool from our page can not only detect and delete 6789.com, but also clean your system from other possible infections. Moreover, as it has malware prevention functionality, it will allow you to surf the Web without having to worry about similar and more serious parasites that you may encounter online.